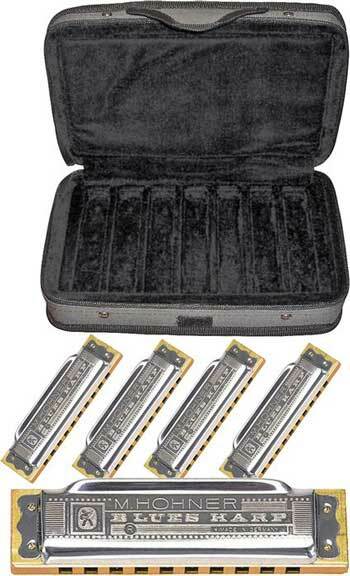 The Case of Blues Harmonica 5-pack gives you Hohner 532/20 Blues Harp harmonicas in the keys of G, A, C, D, and E. Keeping them nice and protected is a padded gray case with a black plush interior that fits a total of 7 harps. It has a hook-and-loop fastener as well as a zipper to keep them from falling out, and a handle for easy carrying. These 20-reed harmonicas feature a wood comb, are great for 2nd position note-bending, and are made in Germany. Until now, harmonicas just weren’t made for blues. For one thing, they didn’t last. After two or three blues sessions it was tough even for a musician like Mel Lyman to get a good sound. The punishment of blues wailing often caused the reeds to lose pitch and flat out. Now you’ve got the blues harp. With a new kind of reed system. And you can get a great blues sound with a minimum of effort. Mel said the Blues Harp was the best harmonica he’d ever played. See if you don’t agree.